Video game movies… the bane of every video game geek. So many turn out to be terrible movies and they fail to capture what people loved about the games in the first place. The latest gamble is Prince of Persia: The Sands of Time based on the 2003 game of the same name. 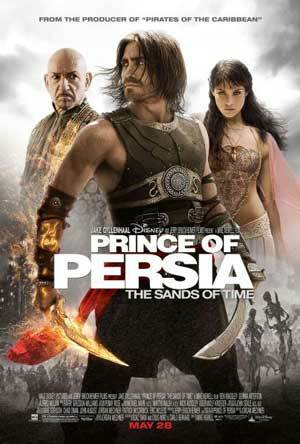 Prince of Persia: The Sands of Time stars Jake Gyllenhaal as Dastan, the titular prince. Dastan was originally an orphan, growing up on the streets and rooftops of the empire’s capital city, until one day after standing up for a friend on the marketplace, the king notices him and takes him in. Years later Dastan and his brothers are sent to the holy city of Alamut, ruled by the stubborn princess Tamina (Gemma Arterton). After being blamed for a crime he didn’t commit, Dastan is forced to flee the city with Tamina and prove his innocence. I really enjoyed Prince of Persia, although it’s not without its faults. From the trailers, I was expecting a fun entertaining action movie, similar in vein to Pirates of the Caribbean or The Mummy (if you haven’t seen the trailer, check it out here). And it pretty much lived up to those expectations. If you didn’t like either of those movies, chances are you’re going to hate Prince of Persia too. If you loved those movies (which I did), I think you’ll be in for a treat. Jake Gyllenhaal is great as prince Dastan. I had my doubts about him when his casting was announced, but he was exactly what I had imagined the prince to be. Charming, but at the same time rough and mischievous. Gemma Arterton is much better here than in Clash of the Titans, showing that with a decent script she can actually deliver. I loved the banter between her and Dastan! The story is similar to the Sands of Time video game with Dastan finding a dagger with which he can travel a few seconds back into time. While not used frequently within the movie, it gives us a couple of gorgeous scenes where Dastan falls apart into sand while ‘traveling’ back. The rest of the plot is pretty okay, although a little bit on the predictable side and at times not as polished as it could have been (like bad guys suddenly appearing without any explanation). I like that they added the orphan backstory, giving a reason to why a prince would be jumping from ledges and rooftops. And those action scenes where Dastan is jumping all over the place are fantastic. Both Gyllenhaal and the kid that played the younger Dastan did most of their stunts themselves, having trained closely with Parkours legend David Belle. I didn’t like the way most of these were filmed though: an overuse of slow-mo and angles that didn’t really work for me. Still the stunts were amazing to watch! Is it a good video game to movie adaption? Yeah, I think it is. Prince of Persia: The Sands of Time is a fun summer action movie with great action sequences that harken back to the video game. The plot is a bit simple, but it’s a good 2 hours of fun entertainment. And want to bet we’ll get a sequel soon?